This guide will help you find print and electronic resources on and about fairy tales. To do a general search for fairy tales,search the Library catalogue. Sometimes this is spelt in varying ways. You could do separate searches on the variable spellings or a search like this - fairytales OR fairy tales OR faerie. To refine your results list, scroll down the left hand column to SLV collections and choose Children's. To view only electronic resources choose Online resources. To find versions of specific fairy tales in our Children's Literature Collection search the Library catalogue under keywords from the title and/or the collector. For example for versions of Cinderella, enter the terms Cinderella and Grimm. 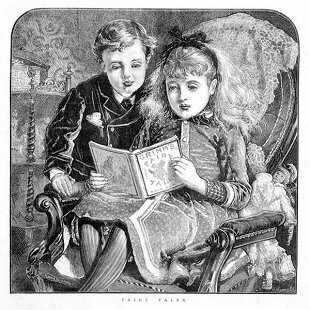 Nineteenth Century Collections Online is a new database of 19th century texts for children which includes examples of fairy tales. After clicking on this link, select the view online option, limit your search to Children's Literature and Childhood, then add your keywords in the search box. The multivolume Index to fairy tales covers the period 1870 to 1992 and is available in the Redmond Barry Reading Room. A late 19th century pop-up book held in the rare component of the Children's Literature Collection is Peeps into fairyland which can be requested for use in the Heritage Collection Reading Room by phoning 8664 7002 or making a request at an Inquiry desk for the next available delivery time. A short history of pop-up books is given in the online exhibition Moving tales: paper engineering and children's pop-up books. Information about our exhibition on the representation of women fairy tales, Evil females in children's books, can be viewed online. To find the history of fairy tales or critiques of their meaning and significance, search the Library catalogue. Enter the phrase fairy tales history criticism and click Search. Refine your results list using the options shown in the left hand column.